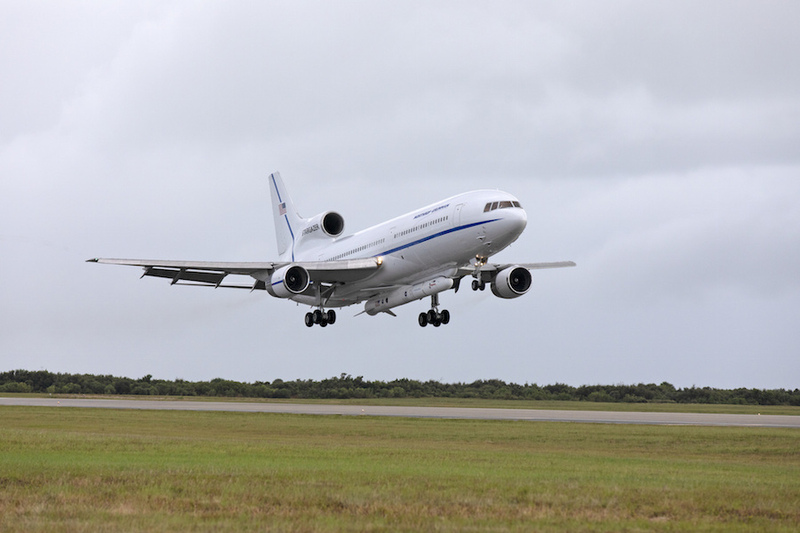 On June 6, Northrop Grumman's L-1011 Stargazer aircraft took off from Vandenberg Air Force Base in California with a Pegasus XL rocket carrying NASA's Ionospheric Connection Explorer mission, en route to Kwajalein Atoll. The mission has been relocated to Cape Canaveral, targeting an Oct. 6 liftoff. A $242 million NASA mission to study the upper atmosphere is on its way to Cape Canaveral in preparation for a rare air-launch off the coast next Friday. Northrop Grumman’s L-1011 Stargazer jet departed Vandenberg Air Force Base on Friday morning and was expected to touch down around 4 p.m. at Cape Canaveral Air Force Station’s Skid Strip. Soaring to 39,000 feet, the Stargazer will drop Northrop’s 57-foot Pegasus XL rocket carrying the 634-pound satellite off the coast of Daytona Beach as early as 4:05 a.m., near the opening of a 90-minute launch window. The three-stage, solid-fueled rocket should deploy the refrigerator-sized satellite less than 12 minutes later in an orbit 360 miles high. The launch won't be visible from the shore, but will be televised on NASA TV. The Northrop Grumman Pegasus XL rocket shown inside Building 1555 at Vandenberg Air Force Base in California, on Oct. 8, 2018. An Oct. 19 ferry flight transported the rocket and NASA's Ionospheric Connection Explorer (ICON) satellite to Cape Canaveral in preparation for launch early Oct. 26. The two-year mission will study the region where Earth's upper atmosphere interacts with the electrically charged ionosphere, influencing the activities of low-orbiting satellites and quality of GPS signals. Rocket issues delayed the launch once planned late last year. In June, NASA switched the launch site from Kwajalein Atoll to Cape Canaveral. The mission concludes a series of six missions in less than eight months managed by NASA’s Launch Services Program, which is celebrating 20 years at Kennedy Space Center. Launching for the 44th time since 1990, the Pegasus is flying for only the third time in more than five years. In December 2016, a Pegasus XL successfully launched NASA's $157 million CYGNSS hurricane forecasting mission from Cape Canaveral. The Northrop Grumman Pegasus XL vehicle is being prepared for its move from Building 1555 to the hot pad at Vandenberg Air Force Base in California, on Oct. 14, 2018. NASA's Ionospheric Connection Explorer (ICON) is secured inside the rocket's payload fairing. 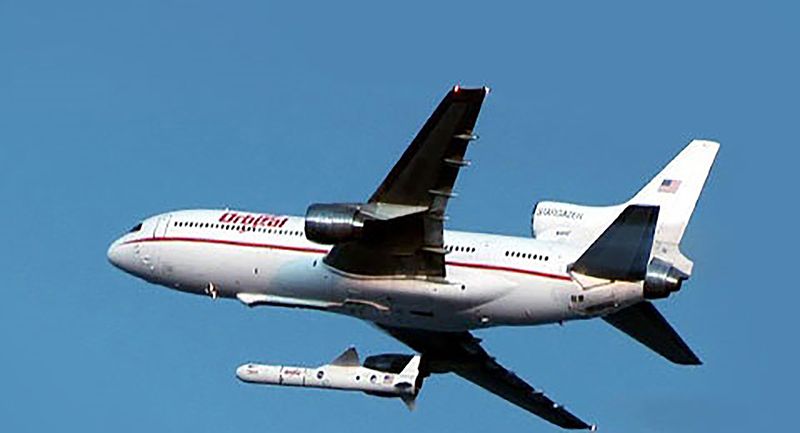 The Pegasus XL rocket will be attached beneath the company's L-1011 Stargazer aircraft, and travel to the Skid Strip at Cape Canaveral Air Force Station in Florida. ICON will launch aboard the Pegasus XL rocket from the Skid Strip at the Cape. ICON will study the frontier of space -- the dynamic zone high in Earth's atmosphere where terrestrial weather from below meets space weather above. The explorer will help determine the physics of Earth's space environment and pave the way for mitigating its effects on our technology, communications systems and society. NASA has delayed this Friday's planned launch of a science mission off Florida's Atlantic coast. The agency said Tuesday it would take time to study an issue with the air-launched Pegasus XL rocket that was discovered during its ferry flight from California to the Space Coast with NASA's Ionospheric Connection Explorer mission, or ICON. 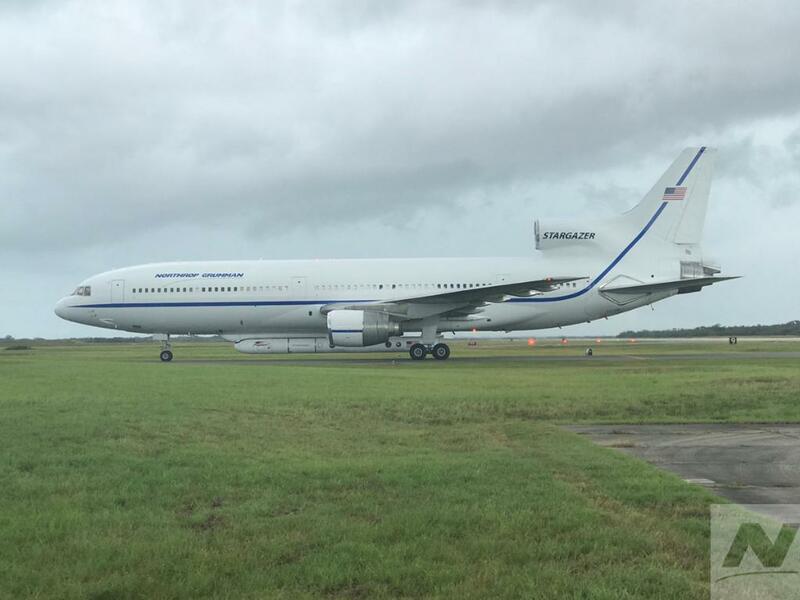 Northrop Grumman's Stargazer L-1011 jet delivered the 57-foot rocket and ICON satellite to Cape Canaveral Air Force Station's Skid Strip last Friday. It's the latest in a series of rocket problems that have delayed the launch once planned last December, and the second to crop up during a ferry flight. The rocket was on its way to a planned launch from Kwajalein Atoll in June when it had to return to California. NASA then decided to switch the launch site to Cape Canaveral. No new target launch date for the mission was announced immediately. "Upon completion of the testing, a new launch date will be established," NASA said in a statement. "The spacecraft remains in good health." The mission led by scientists from the University of California at Berkeley aims to study "the frontier of space," the region where Earth's atmosphere and weather interact with the space weather. The space agency said in a brief statement that a new launch date will be established upon completion of the testing. No further information was released by NASA or Northrop Grumman. The three-stage, 55-foot-long (17-meter) Pegasus XL rocket arrived at Cape Canaveral Air Force Station’s Skid Strip runway Friday evening after a cross-country ferry flight under the belly of its L-1011 carrier aircraft from Vandenberg Air Force Base, California. The L-1011 flight crew navigated through the Pegasus rocket’s “drop box” at an altitude of 39,000 feet (11,900 meters) around 50 miles (80 kilometers) east of Daytona Beach before landing at the Skid Strip. The practice run was intended to familiarize the pilots with the drop zone, and verify the Pegasus rocket’s compatibility with the U.S. Air Force’s range safety systems at Cape Canaveral. Activities that were planned in the final week leading up to Friday’s launch included a launch rehearsal, additional range compatibility checks, inspections and final closeouts on the rocket. The ICON satellite fastened to the Pegasus XL rocket will explore a mysterious connection between the ionosphere, a layer in the upper atmosphere ranging more than 60 miles (or 100 kilometers) above Earth, and weather conditions closer to the planet. Scientists have long thought the solar wind was the leading influencer on conditions in the ionosphere, where plasma and particles converge to generate colorful auroral displays. Plasma in this region can also potentially impact communications, satellite navigation, and even electrical power grids. ICON is the first mission dedicated to examining the link between weather on Earth and conditions high above the planet. ICON’s ride into space has been delayed more than a year by concerns related to its Pegasus launcher. The delays ultimately drove NASA and Northrop Grumman to move the launch’s staging base to Cape Canaveral from Kwajalein Atoll, where the U.S. Army runs a test site in the mid-Pacific Ocean. Engineers wanted more time to inspect the Pegasus rocket motors after they were mishandled during shipment to Vandenberg, officials said. That pushed the launch back from June to December 2017, the next availability in the military-run range at Kwajalein in the Marshall Islands. Then managers decided to ground the mission to assess the reliability of bolt-cutters used to jettison the Pegasus rocket’s payload fairing and separate the satellite in orbit. With that concern resolved, managers moved forward with plans to launch the Pegasus XL rocket with ICON on June 14. But engineers noticed an unexpected telemetry signal from the rocket’s rudder fin actuator after the L-1011’s departure June 6 from Vandenberg on a two-day ferry flight to Kwajalein. During a planned stopover in Hawaii, officials decided to abort the mission and return the rocket to California for troubleshooting, giving up ICON’s launch slot at the busy military test range at Kwajalein. Workers removed the rocket from the carrier jet and returned it to the Building 1555 hangar, where they traced the problem to a faulty sensor requiring replacement. That prompted NASA and Northrop Grumman to move the ICON launch from Kwajalein to a point off Florida’s east coast. The Pegasus XL rocket will place the roughly 600-pound (272-kilogram) ICON satellite, also built by Northrop Grumman Innovation Systems, into a 357-mile-high (575-kilometer) orbit inclined 27 degrees to the equator. It turns out ICON ended up weighing a little less than originally planned, meaning its Pegasus launcher can steer the satellite into its planned orbit within needing a launch site closer to the equator. Officials then delayed the mission from a planned launch date of Oct. 6 to address a quality issue with a vendor-supplied electrical connector on the Pegasus rocket. 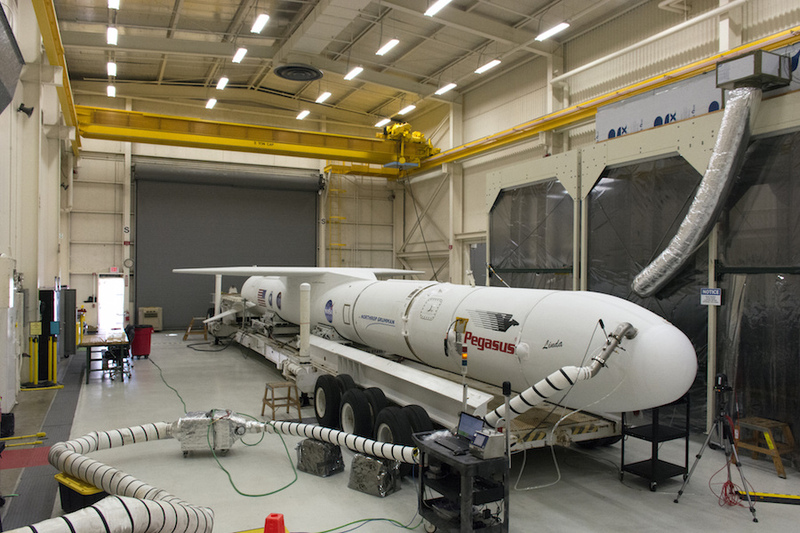 The ICON mission will be the 44th launch of a Pegasus rocket on a satellite delivery mission, and the 34th in the Pegasus XL configuration with uprated solid rocket motors. It will be the seventh Pegasus launch based out of Cape Canaveral, which hosted the most recent Pegasus rocket mission in December 2016. Northrop Grumman's Pegasus XL rocket, containing NASA's Ionospheric Connection Explorer (ICON), is attached beneath the company's L-1011 Stargazer aircraft at the hot pad at Vandenberg Air Force Base in California, on Oct. 14, 2018. The Stargazer will take off from the hot pad and travel to Cape Canaveral Air Force Station in Florida. The Pegasus XL rocket will launch ICON from the Skid Strip at the Cape. ICON will study the frontier of space - the dynamic zone high in Earth's atmosphere where terrestrial weather from below meets space weather above. The explorer will help determine the physics of Earth's space environment and pave the way for mitigating its effects on our technology and communications systems. Northrop Grumman's Pegasus XL rocket is expected to take to the skies off Cape Canaveral on Saturday morning, but not for a launch. NASA and the company plan to perform a flight test to collect more information from rocket sensors that engineers want to understand better before proceeding with a launch of a $242 million NASA science mission. Northrop's L-1011 Stargazer jet, carrying the 57-foot Pegasus and NASA's Ionospheric Connection Explorer (ICON) mission under its belly, will take off from the Skid Strip at Cape Canaveral Air Force Station and fly a path similar to the one planned on launch day. The jet will soar to an altitude of about 39,000 feet off the coast of Daytona Beach, and potentially stay in the air for several hours. The air-launched Pegasus rocket is equipped with new sensors suite that have produced some data not seen on previous missions. The potential concern was revealed during two different ferry flights — one when the rocket was headed west over the Pacific Ocean to a planned launch from Kwajalein Atoll last summer, and again during its cross-country flight from California to the Cape on Oct. 19. Inside a Northrop Grumman facility in Gilbert, Arizona, NASA's Ionospheric Connection Explorer (ICON) satellite was on a work stand on June 12, 2017. The mission is targeting an Oct. 6 launch from Cape Canaveral on Northrop's Pegasus XL rocket, after being droped from the company's L-1011 Stargazer aircraft. The launch had been planned for Oct. 26, but was delayed soon after the mission arrived at the Cape. Pending a review of the test flight data, mission managers could clear the rocket to launch ICON as soon as next Wednesday or Thursday. On launch day, the Stargazer will take off around 3 a.m., planning to drop the rocket at altitude during a 90-minute launch window opening an hour later. The flight will be the 44th by a Pegasus rocket since 1990. The mission aims to study the region where the upper atmosphere meets the edge of space, where terrestrial and space weather interact. The launch of a NASA research satellite built to probe conditions along the boundary between Earth’s atmosphere and space has been tentatively rescheduled for no earlier than Wednesday off Florida’s east coast, pending the conclusion of a review of unexpected data signatures discovered on the first stage of the mission’s air-launched Pegasus XL rocket, officials said Friday. The Ionospheric Connection Explorer, or ICON, satellite is mounted to the forward end of the Northrop Grumman Pegasus rocket underneath the belly of an L-1011 carrier jet at Cape Canaveral Air Force Station. A launch readiness review is planned as soon as Monday or Tuesday to examine the results of troubleshooting and testing to investigate unexpected data signatures detected during the cross-country ferry flight of the L-1011 airplane and the Pegasus rocket from Vandenberg Air Force Base in California to Cape Canaveral on Oct. 19. If engineers deem the rocket healthy, the Pegasus XL will be carried aloft to an altitude 39,000 feet (11,900 meters) over the Atlantic Ocean, where it will be dropped on an easterly heading to fire into orbit around 3:05 a.m. EST (0805 GMT) Wednesday. “During that flight, we saw some indications that we didn’t like on the control system on the Stage 1 motor, and we spent a lot off time troubleshooting that on the ground, and decided to change out some hardware,” said Phil Joyce, vice president of small launcher programs at Northrop Grumman Innovation Systems. The L-1011 carrier aircraft, named “Stargazer,” took off Oct. 29 on a nearly five-hour test flight to gather more data on the Pegasus control system. The test flight included multiple runs through the Pegasus drop box around 100 miles (160 kilometers) east of Daytona Beach, plus a route over Florida and the Gulf of Mexico. The airplane returned to Cape Canaveral’s Skid Strip runway, where ground crews have conducted additional testing on the rocket to look into the cause and implications of the data signature, which Joyce said was noted in an electrical system associated with the fist stage control system. “The issue that we had caused us to really focus in on a lot of the extremely detailed data that we look at from these flights,” Joyce said in an interview Friday. Joyce said the issue currently under review is similar, but not identical, to unexpected data detected during a ferry flight of the Pegasus rocket and ICON satellite to Hawaii in June, en route to a launch staging base at the U.S. Army Reagan Test Site on Kwajalein Atoll in the Marshall Islands. Engineers noticed an unexpected telemetry signal from the rocket’s rudder fin actuator after the L-1011’s departure June 6 from Vandenberg on a two-day ferry flight to Kwajalein. ICON will launch into a 357-mile-high (575-kilometer) orbit inclined 27 degrees to the equator. The roughly 600-pound (272-kilogram) satellite ended up weighing a little less than originally designed, allowing managers to relocate the launch from near the equator over the Pacific Ocean to the Atlantic Ocean off Florida’s east coast. With ICON’s lower mass, the Pegasus has the ability to boost the satellite into the correct orbit without requiring a launch base so close to the equator. There are also more launch dates available at the Air Force-run Eastern Range at Cape Canaveral than at Kwajalein, which is often busy hosting military missile tests. ICON carries scientific instruments to investigate plasma waves in the ionosphere, a layer in the upper atmosphere where colorful auroras are generated. Changes in the ionosphere can also affect communications and navigation signals coming from satellites, and ICON will study how weather systems lower in the atmosphere can influence conditions at the edge of space. Joyce lauded the Air Force’s 45th Space Wing at Cape Canaveral for the late change in ICON’s launch site. NASA originally intended to launch the $252 million ICON mission in June 2017, but the mission was delayed after the mishandling of Pegasus rocket motors during transport to Vandenberg, where Northrop Grumman assembles Pegasus launchers, regardless of their ultimate launch location. Engineers also delayed the flight to assess the reliability of bolt-cutters used to jettison the Pegasus rocket’s payload fairing and separate the satellite in orbit. Over the last few months, Northrop Grumman returned ground support equipment for the Pegasus rocket and L-1011 carrier aircraft from Kwajalein to Vandenberg, then trucked the hardware to Florida in preparation for the mission. “I think it demonstrates the responsiveness of the Pegasus system,” Joyce said of the late switch in launch sites. The Pegasus XL rocket is 55 feet (17 meters) long and is made up of three solid-fueled stages. Pegasus rockets have launched 43 times on satellite delivery missions, and ICON’s launch will be the first Pegasus flight since December 2016. Assuming engineers can clear the Pegasus rocket for launch, the Air Force range — comprising a network of flight safety and tracking facilities — can support launch dates on Wednesday and Thursday. After that, the Air Force will be busy with pre-planned maintenance on range systems for a few days, Joyce said. The next launch scheduled on the Eastern Range after ICON is set for no earlier than Nov. 14, when a SpaceX Falcon 9 rocket is supposed to lift off from pad 39A at NASA’s Kennedy Space Center with the Es’hail 2 communications satellite. Northrop Grumman's L-1011 Stargazer descends toward the Skid Strip at Cape Canaveral Air Force Station on Oct. 19, 2018. The company's Pegasus XL rocket, containing NASA's Ionospheric Connection Explorer (ICON), is attached beneath the aircraft. The Pegasus XL rocket will launch from the Skid Strip. ICON will study the frontier of space - the dynamic zone high in Earth's atmosphere where terrestrial weather from below meets space weather above. The explorer will help determine the physics of Earth's space environment and pave the way for mitigating its effects on our technology and communications systems. In less than an hour, we'll launch a satellite which takes off before it lifts off ! Our #NASAICON mission takes to the sky aboard a @northropgrumman "Stargazer" aircraft, which releases the #PegasusXL rocket that carries ICON to orbit. Pegasus XL is a winged, three-stage solid propellant rocket built by Northrop Grumman that can launch a satellite into low earth orbit. The Pegasus is carried aloft for launch by a L-1011 jet called the "Stargazer." After takeoff, the aircraft flies to about 39,000 feet over the ocean and releases the rocket. Following a five-second free-fall in a horizontal position, the Pegasus XL rocket's first stage ignites. The aerodynamic lift, generated by the rocket's triangle-shaped wing, delivers the payload into orbit in about 10 minutes. Pegasus XL is used to deploy small satellites weighing up to 1,000 pounds into low-Earth orbit from virtually anywhere in the world where a runway with support and checkout facilities is available. These locations include Kennedy Space Center in Florida, Vandenberg Air Force Base in California, Wallops Flight Facility in Virginia, and the Kwajalein Missile Range in the South Pacific. Here are some typical countdown milestones and key events that take place after the countdown begins. NOTE: Event times and lengths are approximate and subject to change. Pegasus has successfully delivered its payload into orbit! The L-1011 carrier aircraft returns to its departure point.